Despite a growing number of voices calling on Apple to stop airing the National Rifle Association’s NRA TV on its platforms, the pro-gun channel may be here to say — for now, at least. The NRA has come under fire in the wake of the Parkland, Florida shooting in February. Amid massive protests, a slew of major corporations opted to sever their ties to the gun lobbyist group. Similarly, there has been pressure on technology companies to pull NRA TV, the NRA’s online streaming channel that airs pro-gun content, from their platforms. In March, Apple and other tech firms like Amazon were the subjects of a planned boycott meant to protest NRA TV’s availability on those platforms, according to Forbes. 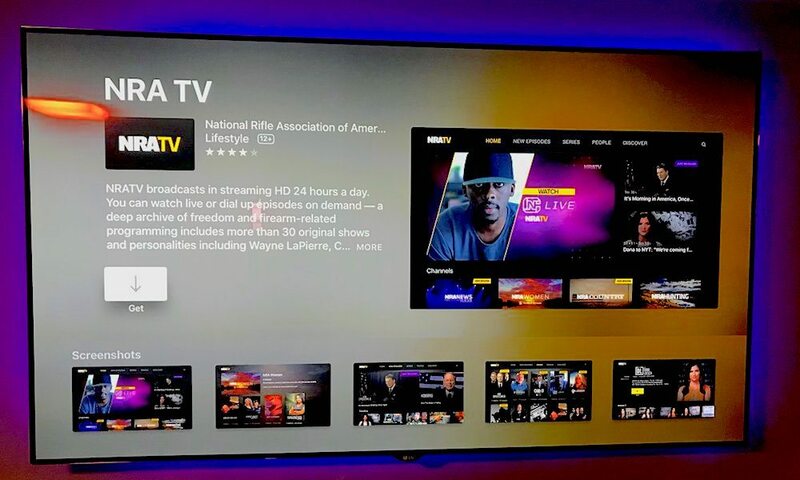 The NRA TV channel has been and is still available on Apple TV. Apple has made it clear that there are no plans to make NRA TV unavailable in the near-term. Eddy Cue, Apple’s senior vice president of services, said in March that it’s “important for America and the world to have debate on certain issues,” adding that the NRA TV app is available alongside a slew of pro-gun control platforms, BGR reported. And in an interview with MSNBC that aired in April, Apple CEO Tim Cook reiterated that stance. The executive said that airing disagreeing views — even those he personally finds “distasteful” — is important for democracy. Alongside various gun-related content, NRA TV frequently airs hosts who claim that mainstream media outlets covertly push a liberal and pro-gun control agenda onto Americans. They also talk at length about alleged plots to confiscate weapons across the country, as well why they think citizens should be armed. But even free speech has its limits. Apple executives are maintaining a close eye on NRA TV to ensure that it doesn’t veer into subversiveness. “You can bet that we continue to monitor and if it walks into the path of hate speech or some of these other things then we’re cutting it off,” Cook said. Eddy Cue added in his interview that if NRA TV “falls off,” the company might be prepared to take it down. He offered the example that, since day one, Apple decided that it did not want the App Store to be a place to buy or sell guns. “Free speech is something we stand behind and it is important, but that doesn’t mean it’s everything,” Cue said.